Photo courtesy of Becky Harrell, Global Ministries. In 2006, Tshala Mwengo, an Africa University graduate from the Democratic Republic of Congo, took part in missionary training with the United Methodist Board of Global Ministries. 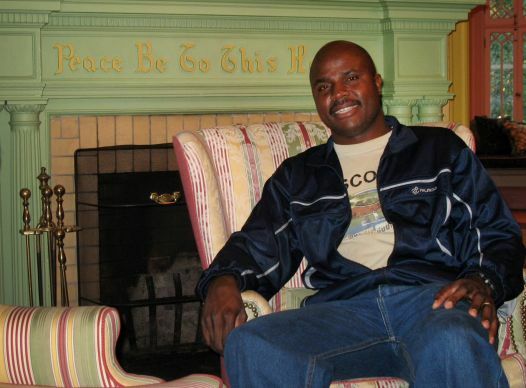 From the time he was a youth, Tshala Mwengo had a dual mission: to bring people to Christ and to better the lives of those in his community, his country and the continent of Africa. As a student at Africa University, he studied agriculture so he could teach others to grow their own food and produce income. As a missionary with the United Methodist Board of Global Ministries, the native of the Democratic Republic of Congo promoted the love of God, the need for education and the importance of self-sustainability. As an uncle, he inspired his nephew, the Rev. Eric Mulanda, to follow him to Africa University and then blessed his new path to ordination and study for a master’s degree of divinity at Garrett-Evangelical Theological Seminary in Evanston, Ill.
Mwengo was a two-time delegate to General Conference, the denomination’s top legislative body. He and his wife, Betty Tshala, also a missionary, were principal founders of Living Word Chapel in Kitwe, where the family, including their two children Lance and Shane, lives. He was on his way from the Mujila Falls Agricultural Centre to see his family, said the Rev. Paul Webster, his co-director there, when he was injured in a bus accident. He shares a grave at Mujila Falls with the ashes of Roxanne Conrad Webster, a fellow missionary who died in 2004. “We have two saints looking over Mujila Falls Agriculture Centre,” Webster, Roxanne’s husband, said. Their connection began in 1995, when the Websters were assigned to the mission in Musokatanda, in what was then Zaire, and Mwengo’s father became his manager. Today Zaire is the Democratic Republic of Congo. The church youth leader had just graduated from a private Catholic agriculture high school. The Websters helped him get to Africa University in Zimbabwe and, as he was studying there, developed the Mujila Falls project in northwest Zambia, which was dedicated in 2000. A year later, after Roxanne Webster was diagnosed with ovarian cancer, they had to return to the United States. Their absence took its toll, but, upon graduation in 2003, Mwengo rescued the failing project. After undergoing missionary training that same year with the Board of Global Ministries, Mwengo returned to Mujila Falls as Webster’s co-director, helping to expand and develop the farm, improve corn production, reduce malnutrition and infant mortality and start a preschool. He also arranged for internships for Africa University students. “Many, many people in the area were able to improve their homes, send their children to school by selling the surplus they suddenly were able to produce,” Webster noted. Mulanda, who considered his uncle to be a mentor and friend, spent a few months with Mwengo at Mulija Falls after pursuing a bachelor’s degree in agriculture, which he earned from Africa University in 2008. “My uncle was among the people who empowered and inspired me to follow my call to ministry,” he said. After graduating with a second degree from Africa University in 2012, Mulanda stopped to see Mwengo again in Zambia on his way home for ordination. Mulanda attributes his own life as part of his uncle’s legacy, along with the faith of his family, the faith of many others who Mwengo brought to Christ, his support and promotion of education for others. One of the biggest legacies is the mission in Zambia. Mwengo’s work at Mjuila Falls was admired and supported through some of the denomination’s U.S. annual (regional) conferences. In the Indiana Conference, for example, a volunteer work team from Central United Methodist Church in Richmond, Ind., were preparing for an April 21-May 9 trip to Zambia when they learned of his death. The church has provided both salary support and assistance to the agricultural project. “In grieving for Betty, Tshala's wife, their family, Paul Webster, and everyone at Mujila Falls, I also grieve for Mujila Falls Agriculture Centre,” wrote the Rev. Ted Halsted, a retired pastor and the team leader, in an email as he mourned “the great loss” of his leadership. At least 17 congregations in the Northern Illinois Conference, where the missionary couple visited in 2012, also supported Mwengo in recent years, according to the Rev. Michael Mann, associate director of mission and advocacy. “One grieves over the death of one’s friend but many will grieve over the loss of this compassionate and visionary missionary,” said Emmy Lou John, former Northern Illinois Conference secretary of Global Ministries. *Bloom is a United Methodist News Service multimedia reporter based in New York. Follow her athttp://twitter.com/umcscribe.or contact her at (646) 369-3759 or newsdesk@umcom.org.